The children are now working as if I did not exist." 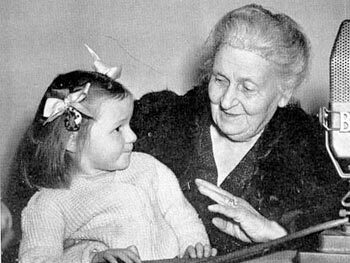 Dr. Maria Montessori developed the philosophy and system of education known as the Montessori Method based on her scientific observations of young children’s learning styles. An Italian physician and educator, she saw that learning is enhanced when young children touch, seeing, smell, taste and explore. Her unique learning materials are incorporated into an environment that encourages overall development. Multi-age classrooms, integral to the method, reinforces the belief that children learn from and with each other. As a result, an atmosphere of cooperation and teamwork is built. Learning environments encourage each child to understand, collaborate, cooperate, reason and negotiate. The teacher guides each child’s development by creating a dynamic atmosphere, first giving a lesson and then stepping back to allow each child to work. The teacher carefully observes and directs children to the appropriate learning materials. Activities relating to the care of self and the environment. Materials that help the child understand shapes and relationships using all senses. Montessori designed materials that provide the “hands on” experience to support concepts of mathematics. Montessori materials include the movable alphabet, and sandpaper letters, presented phonetically for beginning readers. Geography, history, zoology, botany and physics, allow the child to learn about the universe and the interrelatedness of all life.